News and commentary from around the web and from our academic partners. Local communities are taking the world’s largest polluters to court, from Oakland and San Francisco’s case against big oil to a Peruvian farmer’s suit against German energy firm RWE. Alabama’s low land values and extreme poverty has made it a magnet for landfills, with waste hauled in from across the country for as little as $1 a ton. This year’s honors were juried by Katherine Chia of Desai Chia Architecture, Stefan Knust of Ennead Architects, Jason Long of OMA, Susan T. Rodriguez, and Kim Yao of ARO. New York, San Francisco, San Diego, Austin, and Boston have pioneered Zero Waste programs, but all are falling short of their ambitious plans to improve recycling, reduce waste, and cut emissions. A few miles north of San Francisco, a community of roughly one hundred people live in abandoned boats as “anchor-outs” in Richardson Bay, off the coast of Sausalito. The rules that have governed the design of the country’s built environment since 1947 have created neighborhoods that make walking inconvenient and public transit unviable. Two Cleveland suburbs, Shaker and Parma — one racially mixed, one homogenous — offer a reference point for the cultural fissure that opened up in the Democratic party after the 2016 election. A new report shows how a three-year initiative to invest in parks, libraries, trails, and other civic assets in Akron, Chicago, Detroit, and Memphis has shifted perceptions of nearby neighborhoods. From the architectural zoo of convulsing angles to the apparent lack of care spent on the details, this is bargain-basement building-by-the-yard stuff, argues Oliver Wainwright. In two years’ time, the former Williamsburg Bridge trolley terminal will become the world’s first underground ‘green’ space. The maze-like architecture of the Old City has mostly been demolished and replaced with wider streets that are easier to monitor and control. Boone talks about environmental justice, diversity in landscape architecture, and his work to bring more spaces of Black history into national historic designation. Congestion charging could change not just traffic, but also how we think about the infrastructure cars require in the United States. Fiona MacCarthy transforms Gropius from a dull institutionalist into a stylistic rebel who created a fount of idealism at Bauhaus and fostered a generation of creative talents. In the face of incontrovertible facts about sea level rise, the business of luxury real estate is continuing apace. We need more than inspiration from the heroic struggles of the past. We must also heed lessons learned from disastrous failures and incomplete victories. Campaigners from New York to Toronto and Berlin are fighting back against the attempts by companies like Google, Facebook, and Amazon to take over huge sections of their cities. Even after the advent of the ADA, accessibility can seem an afterthought and considered an added cost. Basic design criteria should foster aesthetics, functional innovation, and inclusion all at once. California housing politics has made for strange bedfellows, with people from some of the country’s richest suburbs fighting alongside rent-strained neighborhoods to oppose Scott Weiner’s SB 50. The Five Keys Charter School put a classroom on wheels and parked it in the poorest neighborhoods of San Francisco. The Man in the Glass House is a searing yet judicious account of the life and work of the controversial architect, writes Martin Filler. What does it mean when Silicon Valley serves as landlord, utility provider, urban developer, (unelected) city official, and employer, all rolled into one? The rescue campaign interrupts the pattern of preservation tending to favor the structures built by dominant wealthy white people, a pattern that presents a distorted view of the past. After the collapse of two buildings last year, city leaders in Marseille are facing increasing pressure to deal with the dilapidated historic buildings that house many of its low-income residents. The city is set to hold a referendum to decide whether to seize 200,000 homes from landlords and turn them into social housing. We need to stop letting capital set the urban terms. Cities need to plan their own megaprojects, invest in the transportation network, and then let the developers in to fill them out—on the city’s terms. This two-part feature includes insights on the iconic Californian community from the developer Al Boeke, Donlyn Lyndon, Barbara Stauffacher Solomon, and many more. Borrowed looks at how libraries in Brooklyn, New York have preserved stories from the borough that could easily have been forgotten without them. The lawsuit argues that the platform’s advertising and data-mining practices, which make it possible for posts to be restricted from certain groups, are in violation of the Fair Housing Act. In California’s most futuristic city, the homeless—distinctly vulnerable to crises and system-wide breakdown—are reading on the nation’s palm that something is going unimaginably wrong. A huge public-works project, aimed at correcting the land-loss crisis caused by attempts to harness the Mississippi River, is getting under way. The Mayor’s office has released a plan to close Rikers Island, reduce New York City’s jail population, and build new facilities with new rehabilitation and community programs. Costa Rica wants to wean itself from fossil fuels by 2050. Every country will have to aspire to something similar if the world is to avert the most dire consequences of global warming. In Chicago, trading companies are battling to get closest to the home of the exchange where some of the world’s most vital financial products are bought and sold, including U.S. Treasuries and the S&P 500. The network of dams that control the Missouri River protects parts of ten states and two Canadian provinces from flooding. But it was not built to withstand today’s extreme weather. In a year that began with record-breaking heat, most of us are still only able to imagine significantly adapting our lifestyles through force of necessity, when all familiar and comfortable alternatives are extinguished. Paul Andersen, J. Frano Violich, and Claire Weisz — jurors for the 66th Annual Progressive/Architecture Awards — discuss what progressive architecture means, and how that definition is changing design. The acclaimed photographer has died at the age of 98, leaving behind a vital archive of gritty and inclusive imagery of life in the city. The depletion of natural resources, the desperation behind human diasporas, and global climate change brings an apocalyptic barrier into view where once our way ahead looked almost clear. The renaming of the Fruit Belt area reveals as much about gentrification as it does the flawed ways tech companies add locations to their maps. A variety of creative projects are finding ways to repurpose the derelict commercial spaces that have proliferated across middle and suburban America over the last thirty years. Since the first trans-Atlantic cable was completed in 1858, companies have collaborated to develop vast undersea networks, but over the past decade, tech giants have embarked on their own projects. Architect Tom Brigden’s fascinating drawings document the protected defining vistas of cities around the world, including London, Vancouver, and Dresden. America’s expansion relied on land grabs as an engine of growth and a way to externalize racial hatred. Trump’s wall signifies its end, but also a new myth on which to project similar grievances. Will the Presidential Center Invigorate or Gentrify Chicago’s South Side? Neighborhood sentiment is positive, but the Center must address persistent concerns about its potential economic, social, and environmental impacts. The prospect of post-Brexit trade has shone a new light on America’s food giants, and on the rural communities that their mega-farms have hollowed out. The inexorable commodification and trade of both resources hold mirrors to global inequalities and ecological plunder. Record-setting floods are overwhelming infrastructure and costing lives after the “bomb cyclone” weather system hit parts of Nebraska, Iowa, and Missouri earlier this month. The Places columnist talks about her work on design, diversity, and her Places book, Where Are the Women Architects? Is Hudson Yards the Neighborhood New York Deserves? When it comes to the future of energy generation, two new books offer interesting answers to the question of when new technologies cause existing industries to start losing value. China’s ban on importing waste has stalled recycling programs around the world, but it also presents a moment to consider alternative solutions. The Japanese architect, teacher and theorist is is credited with fusing East and West, modern and postmodern, and global and local in a visually diverse body of work that symbolized Japan’s global influence. After water, concrete is the most widely used substance on the planet, but its benefits mask enormous dangers to the planet and to human health. Brooklyn’s growth runs along the same timeline as the evolution of our modern ideas about sexuality, argues Hugh Ryan, author of a new book on the borough’s queer history. Its vast scale and thick canopy of birch, aspen, and Caledonian pines make the forests of the Cairngorms, and the ecosystem they support, unlike any other in Britain. The Places columnist talks to Scaffold about the influence of feminism on her work and the responsibility of carrying the mantle for architecture and scholarship. In Capital City, Samuel Stein examines the way the state uses and is used by the $217-trillion real estate industry, and the conflicts its influence produces for urban planners. Boundary-breaking architects Elaine Molinar [BArch ‘88] and Craig Dykers [BArch ‘85] of Snøhetta received the honor this week in Austin. Taking a strong stand against the primacy of the single family home (and the zoning that encourages it), would represent a bold move toward combating climate change. From the first day of architecture school, every student is a Starchitect-in-Training. That needs to change. The city is the ideal place to tackle the problem of how to write about nature beyond the myth of the wild. Route 50, which crosses Nevada from California to Utah, is a place where the lines between John Wayne Westerns and everyday life blur, where ghost towns bleed into living ones. In Urbanism Without Effort, Charles R. Wolfe explores how cities can foster community by encouraging spontaneity and embracing local culture and tradition. Many architects like to talk about the importance of people, but they are often abstract ciphers employed to decorate their visualizations. For Gehry, his buildings are vivid characters. A new series of essays relocate the region from Texas to California at the center of its own history. Kevin Bubriski’s arresting and haunting photographs in Legacy in Stone: Syria Before War include UNESCO world heritage sites that are now completely or partially destroyed. More than 30 years later, the broken windows paradigm has done little to reduce serious crime but has tended to make people feel more unsafe and reduce trust and cooperation with police. In 2007, there were more than 11,600 homeless people in the city. Since then, housing and outreach initiatives have managed to bring that number down by 90 percent. After the Great Recession, homebuyers are more cautious, and they are looking for more flexible spaces: with room for relatives, grown children, Airbnb guests, and home workspaces. Can America Bring Back Big Infrastructure? The drastic downscaling of California’s high-speed rail project has prompted deeper questions about America’s ability to think big on complex public works projects. L.A.’s first design chief and Occidental College professor has emphasized that the success of the city’s future hinges upon improving the discourse regarding architecture and urban design. The proliferation of blocky, forgettable mid-rises in cities across the country relies on the quick and cheap construction method, but they can be dangerous as well as dull. The artist Volker Spitzenberger has now laid more than 70,000 Stolpersteine stones, making them the world’s largest decentralised monument to the Holocaust. Churchill, Manitoba, 1,000 miles north of Winnipeg and connected to the rest of Canada only by rail, faces losing its arctic identity to rising sea levels. The ridesharing app has become a subsidized alternative to the public-transportation systems that it claims to support. The old paternalistic pretense has given way to the overt exercise of coercive power, putting local governments in thrall to private business interests. In Denver and other cities, private groups controlling downtown spaces are actively displacing those with nowhere else to go. The foundation that Brad Pitt set up to help New Orleans after Katrina built 109 homes, but many of them are badly flawed. The design language of gentrification is threatening to become the default in cities around the country. The illustrated story of how a vital piece of social infrastructure came to be, and a reading list. In many places around the resort town, which covers the northern third of Absecon Island, dig down more than eight feet and you’ll hit water. The desert preservationist spent decades campaigning to create Joshua Tree National Park. California’s failure to execute on its high-speed rail plan has important lessons for the congressional progressives pushing for a Green New Deal. The exodus of corporate hubs to Chicago has left surrounding towns scrambling to fill the void. With help from the federal government, institutional investors became major players in the rental market, promising to return profits to their investors and convenience to their tenants. It didn’t play out that way. Three years after first covering the story of the closure of the supercenter in Winnsboro, South Carolina, Christopher Booker returns to see how life has changed. The Trift Glacier is a casualty of climate change, but its loss has created an opportunity for new hydropower infrastructure. The recent shutdown has added urgency to the debate about what a safety net in the region, where one in four residents live below the federal poverty line, might look like. Historic former mining towns across Appalachia are turning to outdoor recreation to transform the regional economy and fill the gap left by the decline of heavy industry. The “Dissolving Boundaries” project uses Jerusalem’s public transportation as a stage for examining relations between Israeli and Palestinian residents. People living in smaller towns or cities tend to rate the quality of their communities higher than residents of large metropolitan areas do. On June 21-22, the McHarg Center will host leading scholars and designers to explore visionary approaches to landscape in the face of climate change and urbanization. In a five-part series, PennDesign fellow David Roberts explores the ambitious project currently underway to reclaim the city’s streets from cars and create new mixed-use public spaces. The University of Arkansas will host the show, curated by the Cultural Landscape Foundation in partnership with the National Building Museum, from April 8 through May 13. Zhang’s proposal, “Revealing Storage: The Stuff of Architecture,” was chosen from a field of more than 80 applicants from around the world. Vandenburgh, who currently leads the School of Art + Design within the College at the University of Oregon, will take up the post on July 1. Since the video game was first released thirty years ago, it has introduced millions of players to the joys and frustrations of zoning, street grids, and infrastructure funding. The Pratt Institute alumna and Gensler principal will present a look at her recent and upcoming projects on March 28. Complexity | Scale | Power, edited by Alex Karner, Katherine Lieberknecht, and Elizabeth J. Mueller, focuses on new approaches to planning in the context of rapid growth and urbanization. 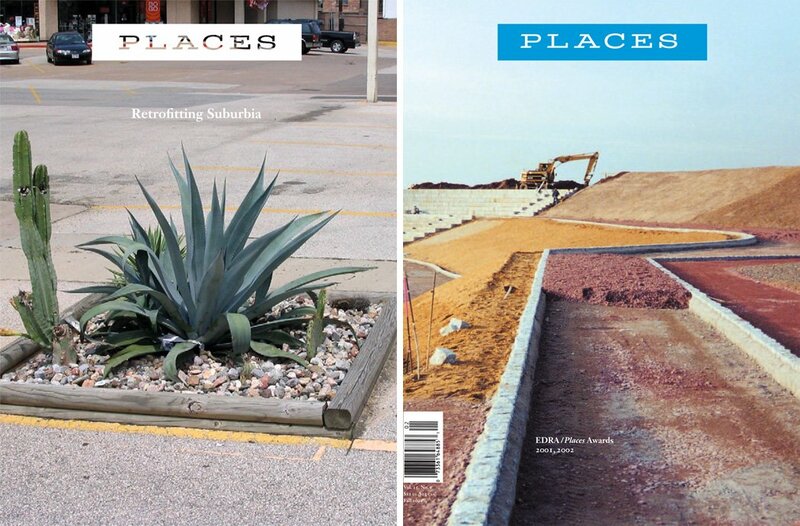 From the South, published by the International Landscape Collaborative, features essays by eighteen emerging scholars that use landscape as a medium to respond to today’s socio-environmental challenges. The visiting faculty fellowship program will bring six scholars working on issues of inequity and justice to engage with the school and the local community through their research and teaching. The capture of today’s strained water systems by private capital is now well underway. If there is a right to water, who should hold the rights to the pipes? UC Berkeley faculty Ronald Rael and his partner Virginia San Fratello are developing novel techniques for sustainable building using low-cost waste materials from mud to coffee grounds. Architecture students from the University of Miami and the UNPHU are working on design alternatives for the reconstitution of sugar mills in the region. Liam Young’s new book explores the technological sublime of non-human spaces designed to service human needs, from data centers to container terminals. Staff and students from the GSA are collaborating with ARDHI University, the Tanzanian government and the World Bank to upgrade open public spaces in the capital city, Dar-es-Salaam. Folded Skies, by UJ GSA lecturers Sumayya Vally and Sarah de Villiers of Counterspace, recreates and reflects on the iridescence created by pollution from the city’s mining dumps. MIT Media Lab’s new interactive “Atlas of Inequality” shows that segregation is not just about where you live, but what you do. The prestigious award is presented annually by the Beverly Willis Architecture Foundation to an academic leader supporting scholarship on women in architecture and engineering. The School of Architecture’s longest-serving faculty member, who taught at the school for fifty years, has donated $5 million to support the field of urban design. The Yale dean and Places board member talks about the challenges of making modern additions to historic buildings and how the right design interventions can give new energy to old spaces. The annual camp offers the chance to learn about the design professions through hands-on experience led by faculty of the Fay Jones School. The School is to be known as the Stuart Weitzman School of Design in recognition of the influential designer and Penn alum’s ongoing philanthropic support of the university. In “Toward an Ecological Aesthetic,” published in the January 2019 issue of Socio-Ecological Practice Research, Steiner examines our sensual connections to natural and cultural processes. In Taking Possession, Heidi Aronson Kolk explores the complex and sometimes contradictory politics of memory at a historic St. Louis townhouse. The co-founder of the Berlin design firm, AllenKaufman Studio, will bring a global perspective to interior architecture in the studio and seminar supported by the Julie Neupert Stott Visiting Professor endowment this semester. Curated by the Oslo School of Architecture and Design’s Mari Lending, Tim Anstey, and Eirik Arff Gulseth Bøhn, the show and accompanying volume explores an ancient landscape in radical transformation. Connor Gravelle, winner of the The Blythe and Thom Mayne Undergraduate Thesis Prize at SCI-Arc, talks about his work. The practice professor emeritus of landscape architecture and renowned landscape architect will receive the honor at Commencement 2019. Symposium 4/4: Architectural Theory Now? Not only are many print journals now gone, architectural theory courses have been eliminated in many schools’ curricula. Speakers including Joan Ockman, Jane Rendell, Jonathan Massey, and Francesca Hughes will discuss its future. Can digital technologies for capturing and reproducing reality deepen our understanding and enrich our experience of built heritage? Speakers including David Gissen and Pilar Bosch Roig will discuss. Open positions include a professorship in Architecture and Building Technology, an associate professorship in Architectural Design and Building Components, and assistant professorships in Digital Fabrication and Urban Design. Faculty from Places partner schools Virginia Tech, Tulane University, University of Michigan, UT Austin, USC, UC Berkeley, and University of Arkansas are among those honored in this year’s awards. Hochhäusl, who joined PennDesign as an assistant professor of architecture this year, is rewriting the history of twentieth-century architecture from the perspectives of gender, personal history, and activism. The Biology and the Built Environment Center at the University of Oregon is developing tools for architects and interior architects to design indoor environments for human and ecosystem health. The first two recipients of the award will focus on preserving cultural heritage in Portland’s Albina neighborhood and investigate how to design spaces and products for healthy aging, focusing on an older demographic. Richard Campanella’s new book explores the particular cultural geography of the city through a series of vignettes that span its 300-year history. On Site, a new freshman course at Taubman College, took students out of the classroom to experience the modern architecture in cities like Detroit and Columbus, Indiana. This semester will feature a new livestream for selected events, including lectures by David Humphrey on February 4, Georgina Huljich on February 6, V. Mitch McEwen on February 11, and Richard Murphy on March 18. Applications are being accepted until April 15 for this year’s course, in which students will travel to Singapore and Shanghai to study the effects of industry and their relationship to housing and commerce. Eschewing the confines of a codified profession can lead, symbolically and actually, to a more diverse, socially relevant, and economically democratic enterprise. A new collaboration at Tulane University between the School of Architecture and the Freeman School of Business will offer the only MBA/MSRED program in the field. The works he left behind in Brazil speaks to the country’s enduring enthusiasm for civic gigantism and Modernism. Andrew Atwood’s new book, Not Interesting, explores what might happen if we were to change the conversation around what makes architecture worth talking about. The new dean of the UW College of Built Environments talks about the challenges and the opportunities that brought her to the school. This semester’s program will address some of the design disciplines’ most pressing challenges, present innovative perspectives on the future of design, and celebrate leaders that have paved the way for change. Too much thought is bound up in ideological forces that devalue the experiences of those most threatened by economic change, argues USC Architecture dean and Places board member Milton Curry. Jesse LeCavalier and J. Alstan Jakubiec have joined the school this winter. The two-day event will convene experts at the forefront of designing, financing, developing and promoting stronger and more equitable communities in America’s cities. The series this semester begins on January 22 and features speakers including Barry Bergdoll, Nina Marie Lister, and Places editor Nancy Levinson. A brand new film showcases the School of Architecture at Aarhus, from its approach to design to the influence of Denmark’s built environment. The Oakland-based architect is the fourth to receive the $100,000 prize and is focused on using design to address the intersecting issues of racial, gender, and economic equity. Incoming NOMA president and Taubman College faculty member Kimberly Dowdell talks about her desire to see more diverse communities designed by more diverse teams. Former rector Karl Otto Ellefsen discusses the process of transformation that began when the Oslo School of Architecture and Design relocated to an industrial complex in 2001.